Model CFAL and CFAS are designed to pass one specific TV channel, reject the adjacent channels, and all out-of -band frequencies. Channels available (CATV): T7 - T13, 2 - 13, A5 - A1, A14 - I22, 23 - 30, and TV-IF (41 to 47 MHz). Available for NTSC and ATSC system. High performance bandpass filters are designed for CATV operation. BP7-HT provides single channel passband and adjacent channel rejection. Use to filter modulators for adjacent operation (ex: chs 53, 54, 55). Available for NTSC and ATSC channels. UHF Channel Tunable bandpass filter designed for Off air antenna systems. It is suitable as pre-selector for 6 MHz TV/RF signal that requires low thru loss and does not require high signal selectivity. Tunable frequency range: 470 to 620 MHz (option ex: 550-700 MHz, 650- 800 MHz, 750-900 MHz). UHF Channel Tunable bandpass filter designed for Off air antenna systems. Also suitable as pre-selector for 6 to 8 MHz RF sisnals. Two models are available to cover frequency ranges: 450 to 540 MHz, 530 MHz to 620 MHz. Provides single channel passband and good out of band rejection. VHF-Hi Channel Tunable bandpass filter designed for Off air antenna systems. Also suitable as pre-selector for 6 to 8 MHz RF sisnals. Tunable from 174 to 216 MHz. Provides single channel passband and good out of band rejection. Designed to pass desired TV channel, and typically roll off >25 dB ± 5-6 MHz (VHF HR series) from passband edges (details- see Specs). Available for CATV and ATSC systems. Available for 6 MHz HD applications as well as 8 MHz European standard. Applications: Pass preferred signal band for receive systems, or, suppress spurs at signal source for signal distribution systems. UHF or CATV Hyperband, cavity-type, single channel bandpass with low loss and highly selective skirt. Low profile - fits into one rack space. Suitable for reception and low power (10 watt) transmitter applications. Standard bandpass is available with 4 cavities. Bandpass channel is user specified and can be factory re-channnalized. 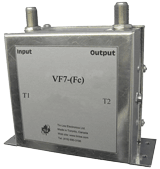 Model NF7 is designed to pass a narrow, 1 MHz, frequency band while attenuating all other signals. All models are 75 ohms impedance with F-type connectors (optional 50 ohms with BNC or N). Tuning range is approx ±10 MHz. Bandpass filter network consists of adjacent channel lowpass and highpass joined together to form a wide bandpass. Custom ordered to pass several consecutive channels. Example: CE7-BP ch.50/56 - pass chs 50 to 56, rejects ch. 49 below, ch. 57 above, and all other channels. Passband loss: < 4 dB ( except band edges - Fc1 and Fc2 - depends on frequencies - see graph). CF7W, custom wide bandpass, combines sharp lowpass and highpass filters together for desired passband., with 5% frequency transition from 3dB BW to 40dB stopband. CF7W HR, custom wide UHF/LTE bandpass, combined Helical resonators to form highly selective bandpass. Available for TV or LTE 700 MHz bands from 400 to 900 MHz, with 6 to 50 MHz bandwidth, with <3.0% frequency transition from 3dB BW to 40dB stopband. CF7W and CF7W HR standard connectors is 75 ohms F-female. Also available with 50 ohms impedance with BNC, N or SMA connectors. Provides spurious suppression for a group of consecutive RF channel modulators. CF7W 174-216/470-806 is low loss pre-selector filter that passes VHF chs 7 thru 13 and UHF chs. 14-69. CF7W 54-216 MHz/470-700 is low loss pre-selector filter that passes VHF 2 thru 13, UHF chs 14 thru 52.